Coghlin Companies proudly participated in the Compass IT Compliance Annual Cybersecurity Symposium in recognition of cybersecurity awareness month. The event was held in North Providence, Rhode Island and brought leaders from both the public, private and government sectors to share the latest trends in information and cybersecurity. In addition to some excellent presentations, several panels were put together to bring varying perspectives on not only the latest cybersecurity threats organizations face, but also actionable take away items that can be implemented to mitigate overall risk of a breach or attack. Panel guests included Congressman Jim Langevin (Senior Member of the House Committee on Homeland Security), Mark Weatherford (First Deputy Undersecretary for Cybersecurity for the Department of Homeland Security), and Captain John Alfred (Captain of Rhode Island State Police Cyber Crimes Unit and Fusion Center Commander). 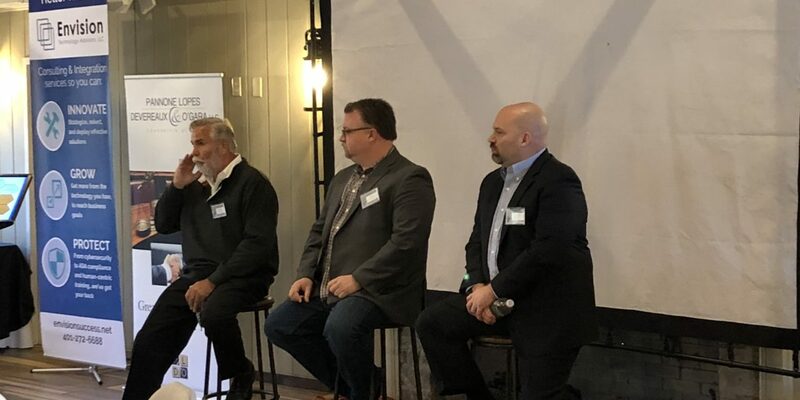 Coghlin Companies Vice President of IT, Mike Barry, participated in a panel and spoke about the importance of having a solid business continuity plan for when the unexpected happens. Mike kicked off the discussion describing the journey when updating the Coghlin Companies plan and how a business impact analysis was completed in order to develop a comprehensive report that identified the potential effects of an interruption to critical business operations. Once the business impact was understood, the critical components were ranked by tier of importance, taking into consideration the recovery time and recovery point objectives. “We wanted to understand any discrepancy in expectations so the business impact analysis certainly helped align our entire team,” Mike said. The business continuity plan is reviewed yearly and includes training for team members through various exercises. Our continuity plan and what we’re doing for data protection is critically important to us and our customers. Through these exercises and training activities, departments such as Facilities, Supply Chain, Operations, and Human Resources are understanding of their role when it comes to business interruptions caused by severe weather or other natural or man-made disasters. Ensure you have a formal and timely monthly patching process, in conjunction with a vulnerability scanning policy and process, which checks to ensure the patching process is effective and vulnerabilities are being mitigated. Keep software up to date – older versions of software, although functional, can introduce security risks, which may increase the further out of date it becomes. Keep training at the forefront – followed by periodic, random testing to ensure the effectiveness of the content and overall retention of the information learned by all employees. Knowledge is power. Stay vigilant – security begins and ends with each every associate in your company. The Coghlin Companies IT team is dedicated to continuously analyzing company and customer technology needs and providing strategic plans for growth and continuous improvement. All proceeds from the event were donated to The Sargent Rehabilitation Center in Warwick, Rhode Island. The Sargent Center serves children and adults with disabilities and their families through their pediatric program, neuro-rehabilitation program and hearing center.